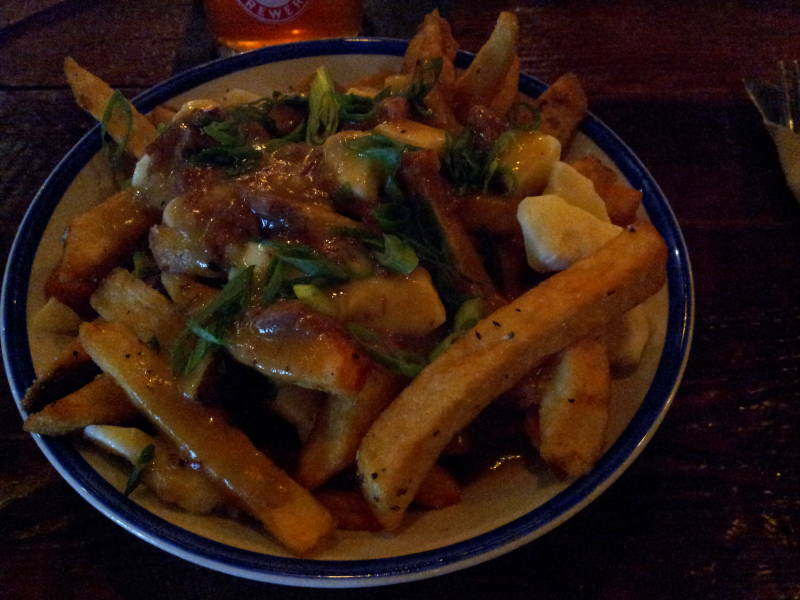 I've been to Ottawa in the summer, and it's very nice. So green and so clean. But to really experience Canada, go in January or February. I'm on my way! I had two teaching jobs in a row, the first in the Washington D.C. area and the second in Ottawa. 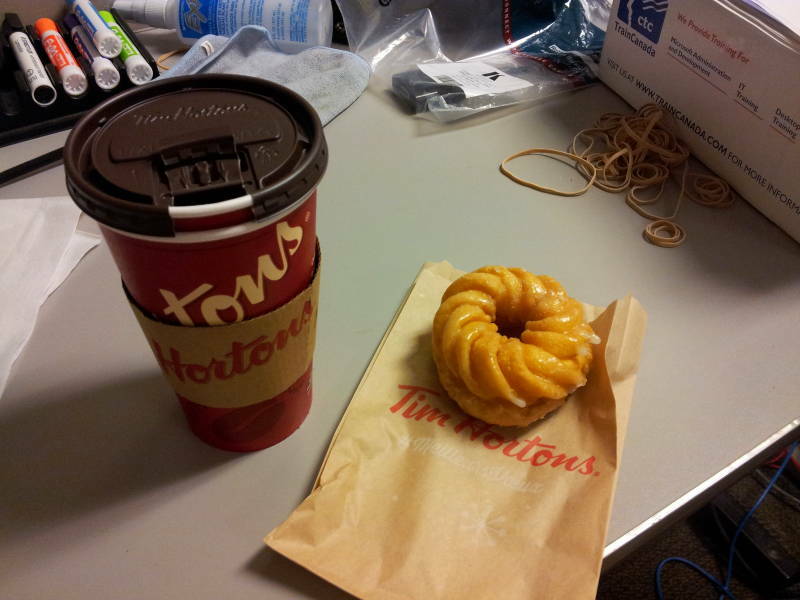 So, early Saturday morning I was on my to Canada. A flight from Washington-Dulles to Toronto. I would go through immigration and customs there, and take a second flight on to Ottawa. 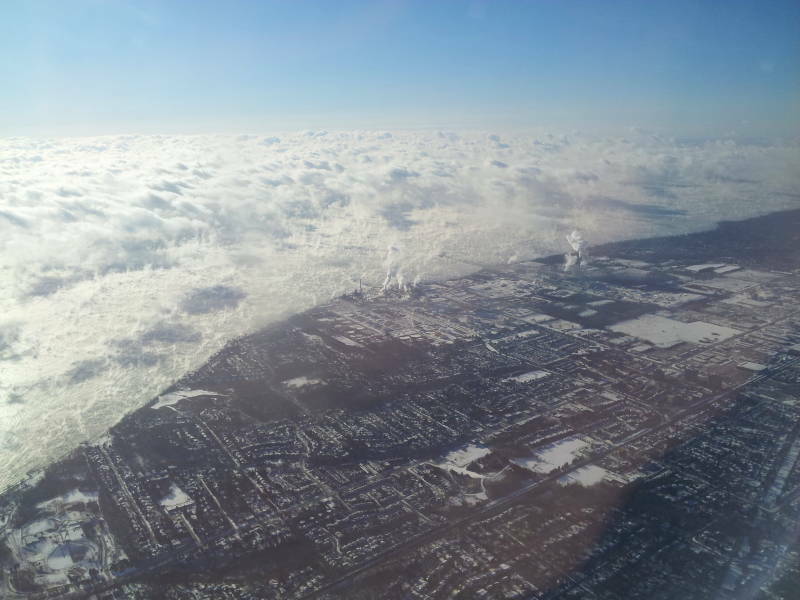 Lake Ontario wasn't frozen, but the air temperature was -26 °C (or -15 °F). Vapor was rising off the surface. It's called sea smoke. A shallow layer of warmer water-saturated air mixes with the much colder air above it. The air close to the surface can no longer hold the water vapor, which condenses out. I was going to Ottawa to teach a Linux course. The second of two weeks in a row, so the company would put me up in a hotel over the weekend instead of buying another round-trip airline ticket. Instead of staying out in the office parks near Dulles Airport, I'll go to Ottawa. 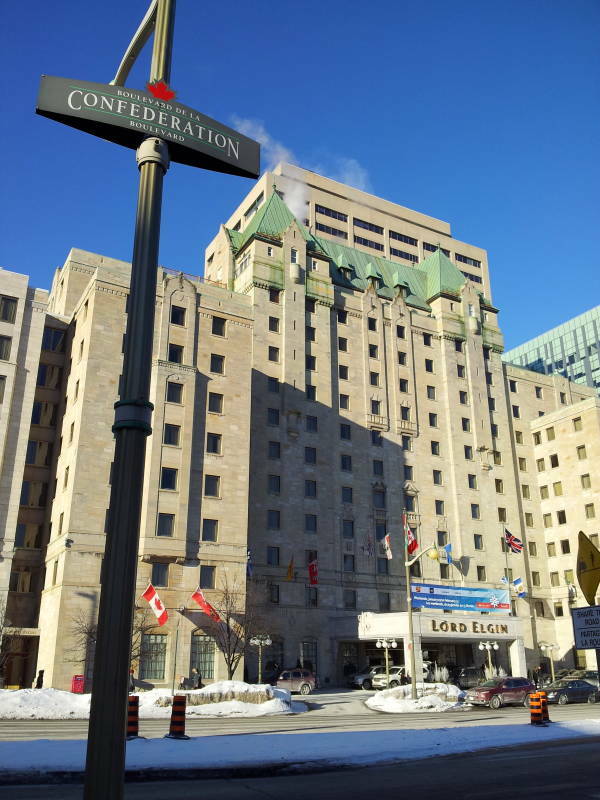 The training company puts instructors in the Lord Elgin Hotel. 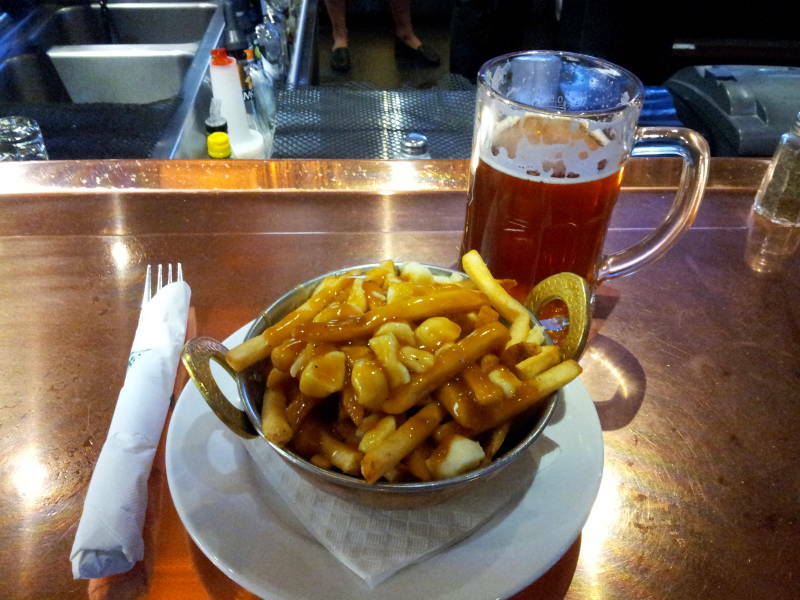 It opened in 1941, primarily to serve guests who were in Ottawa on government and military business during World War II. So, no ballrooms or high-end restaurants as at the nearby Château Laurier, and relatively small guest rooms. Large additions in the 1990s and 2000s added meeting rooms, and the existing rooms were enlarged and refurbished. Upper Canada was the southern portion of today's Ontario, while Lower Canada was the southeastern portion of today's Quebec plus Labrador. They merged in 1841, then in 1867 the Canadian Confederation joined them to Nova Scotia and New Brunswick. The hotel was named for James Bruce, the 8th Earl of Elgin and 12th Earl of Kincardine. He was the first Governor General of the united Upper and Lower Canadas. His father is known for removing the marble sculptures from the Parthenon in Athens. James was a British colonial administrator. He was Governor of Jamaica in 1842-1846, Governor General of the Province of Canada 1847-1852, and High Commissioner and Plenipotentiary in China and the Far East in 1857-1860, at the end of the Second Opium War. He and his troops looted treasures from the Old Summer Palace in Beijing before burning it to the ground. So, Greece, at least he didn't burn down the Parthenon. He also signed the Convention of Peking, which said that China was to cede part of Kowloon Peninsula and Hong Kong to Britain in perpetuity. Then he became Viceroy of India in 1862, dying there a year later. Here's the course site, the Bell Canada tower. 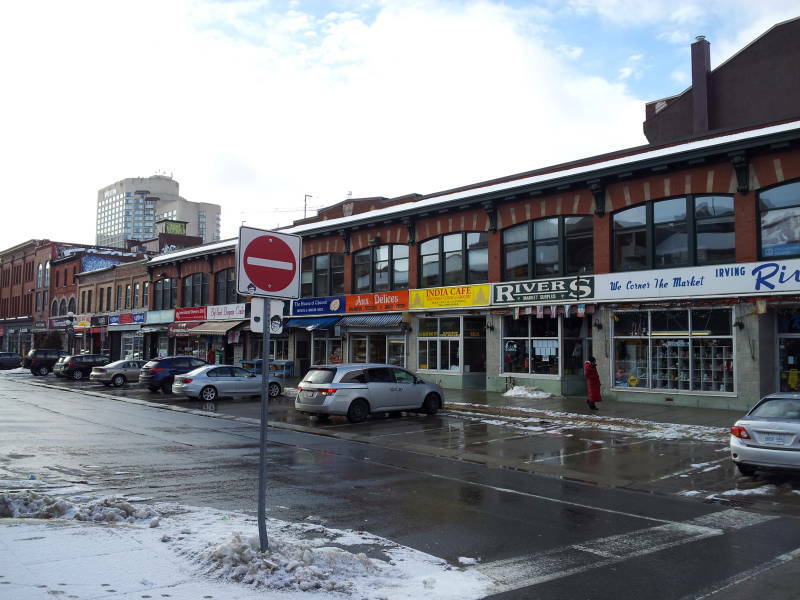 It's just two blocks south on Elgin Street. 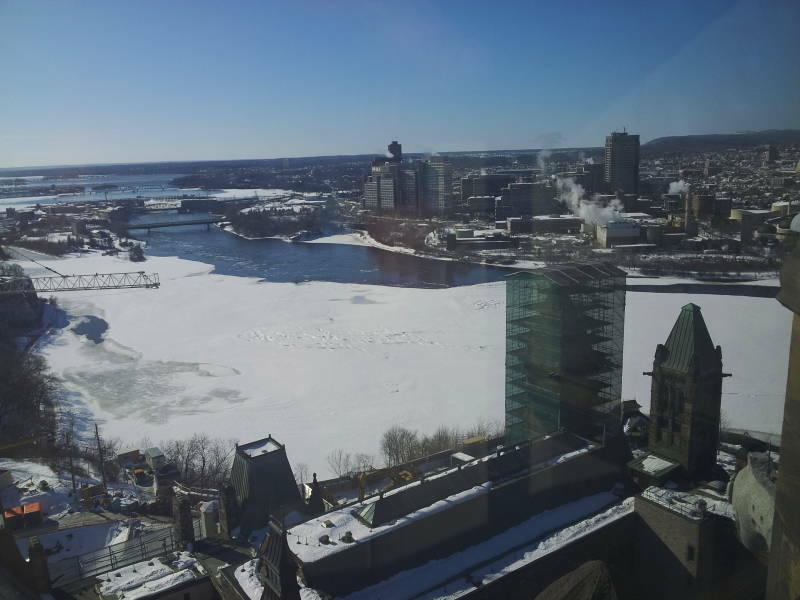 Below is the view from the training company's office suite on the 23rd floor. 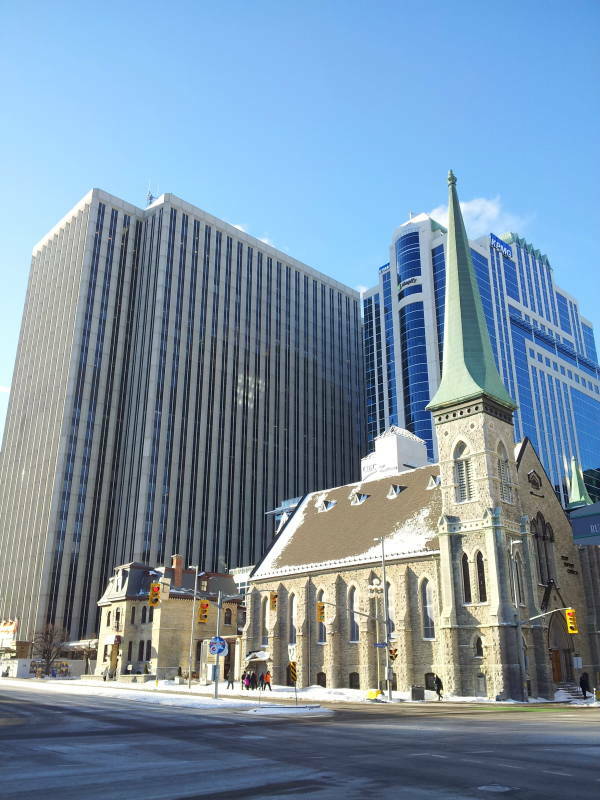 The Lord Elgin is the building with green Gothic peaked roofs, in the block beyond the church steeple. 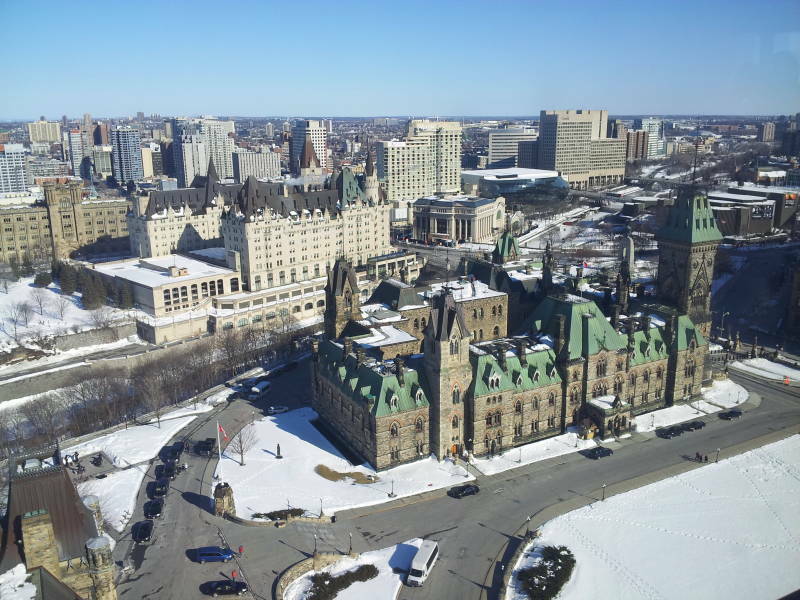 The large building that looks like a gothic castle with a brown roof, 3 or 4 blocks beyond that, is the Château Laurier, another prominent hotel. 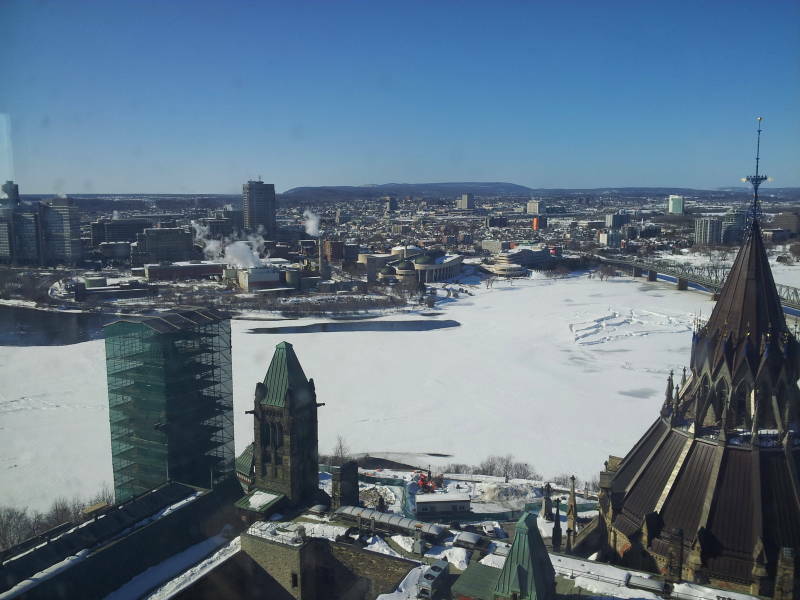 The Peace Tower on Parliament is mostly obscured by vapor, but it's what projects above the horizon toward the left edge of the picture. 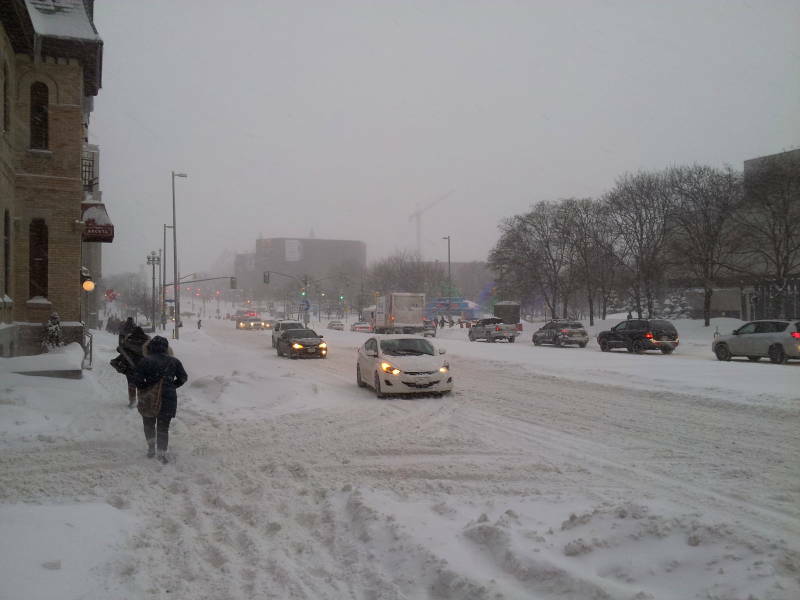 The National Gallery of Art is beyond and to its left. 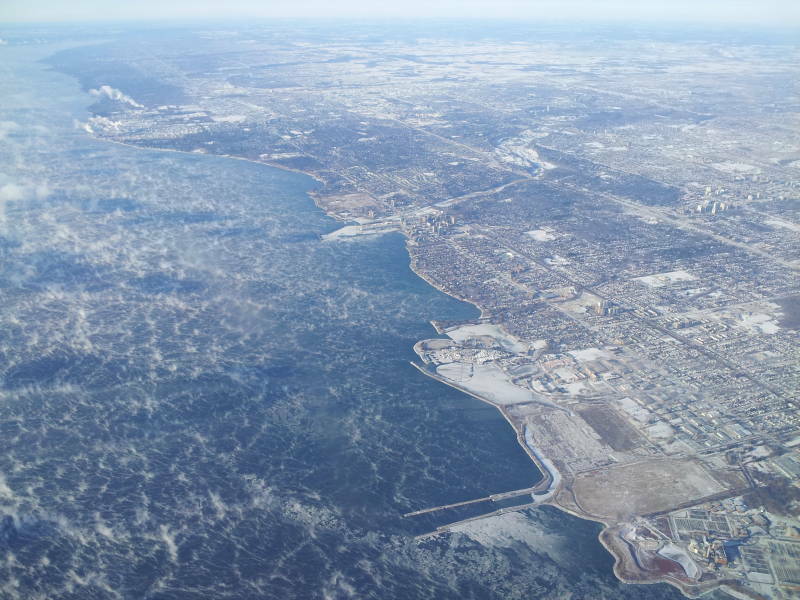 Beyond that, the Ottawa River and then Quebec. 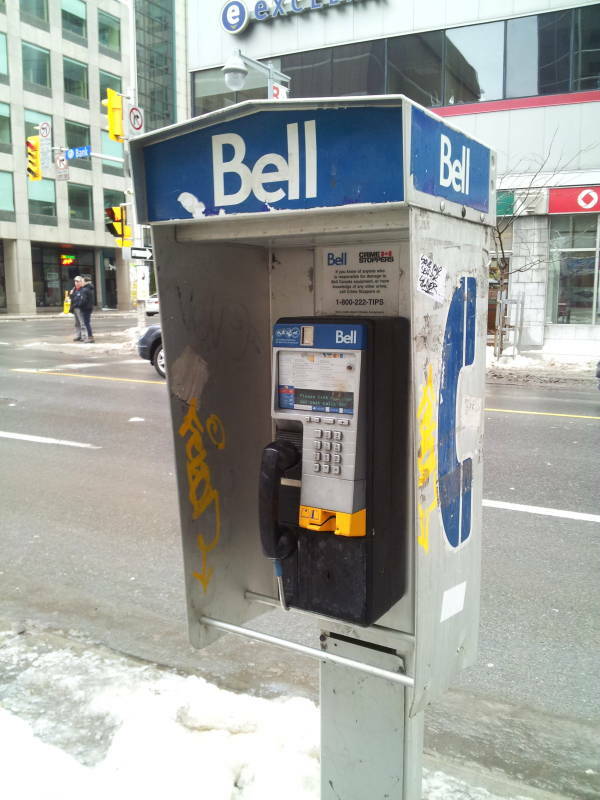 Bell Canada was still operating street payphones. 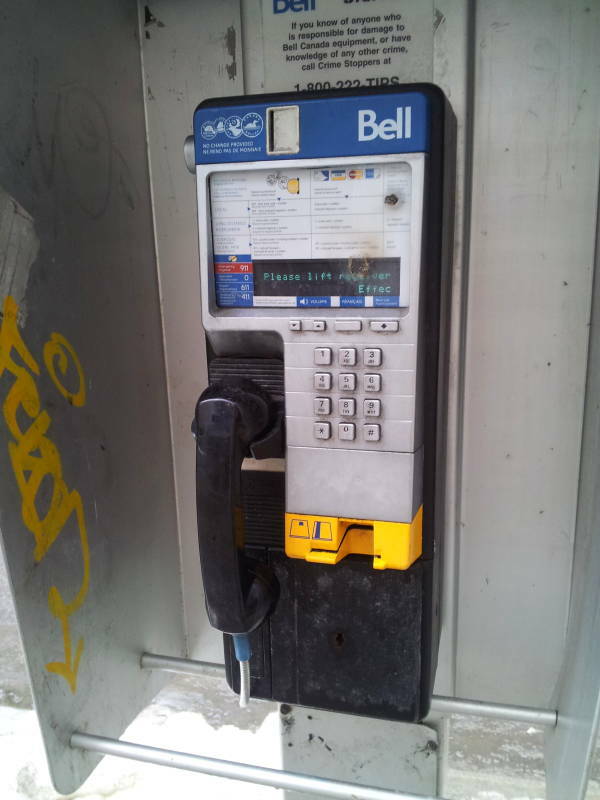 In Canada, payphones aren't immediately destroyed by vandals. 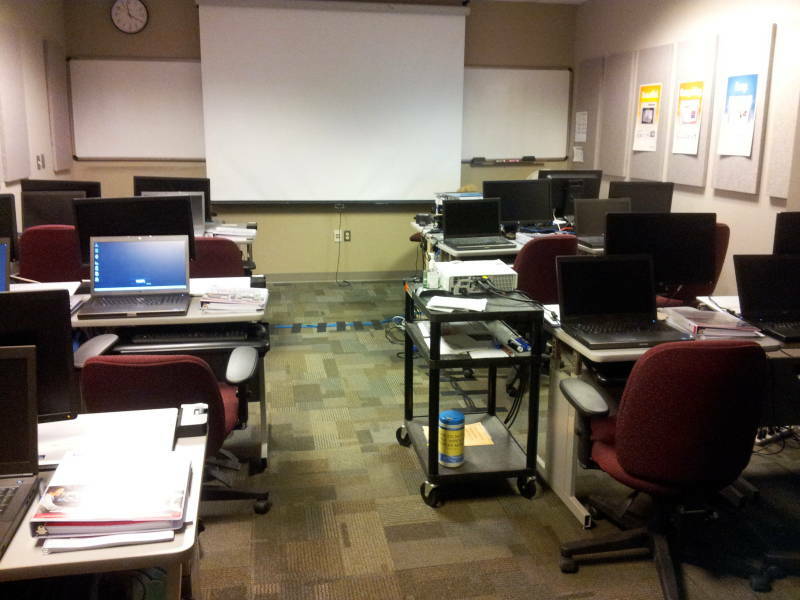 Here's a classroom set up for a Linux server course. It doesn't look very exciting. It was a 4-day course, U.S. companies and government agencies don't want 5-day courses because they last all week. They only grudgingly sign up for 4-day courses, and prefer them to be shorter. Training courses show that Americans aren't so smart. Management often asks for absurd things, like a 4-day course compressed into 2 days. "It can go for extended hours," they say. "Our people are really sharp, so they can finish it in two days." First, adult humans can only learn for about 6 hours a day. Second, when a training manager starts bragging about how sharp their people are, look out. Or at least that's the case in the U.S.
Canadians are far smarter, both in the course topic and how they plan their training. This class was happening in Ottawa, so the people who showed up would know the Linux command line and really get a lot out of the course. It would be a fun and rewarding week for them and me. I would set up the course on Monday. Meanwhile I could explore the area. 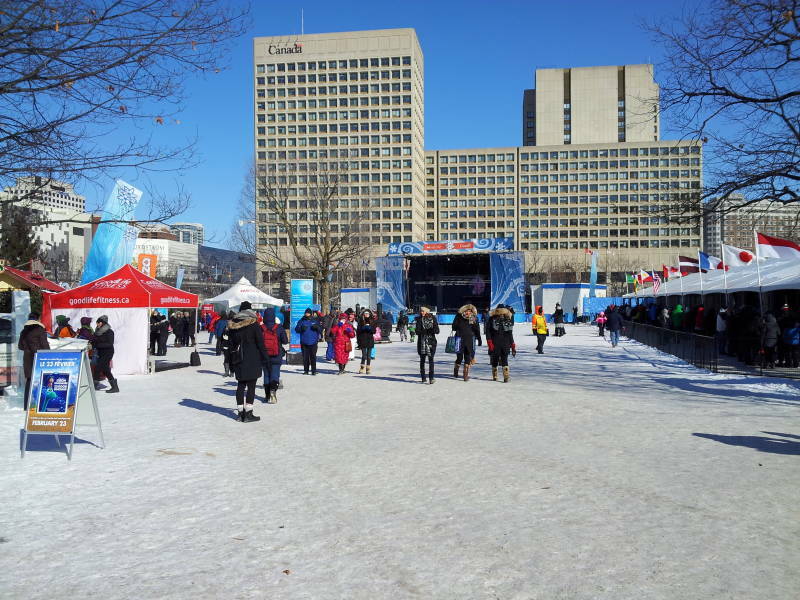 I happened to be there for Winterlude or Bal de Neige. It was centered on Confederation Park, just across Elgin Avenue from my hotel. 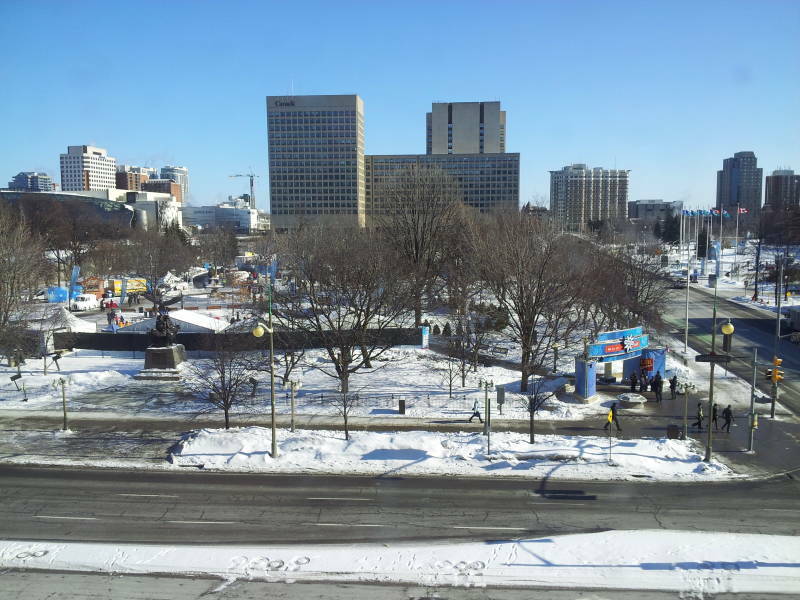 Winterlude is usually the first three weekends in February. Sometimes it's hampered by mild weather. Not this year. 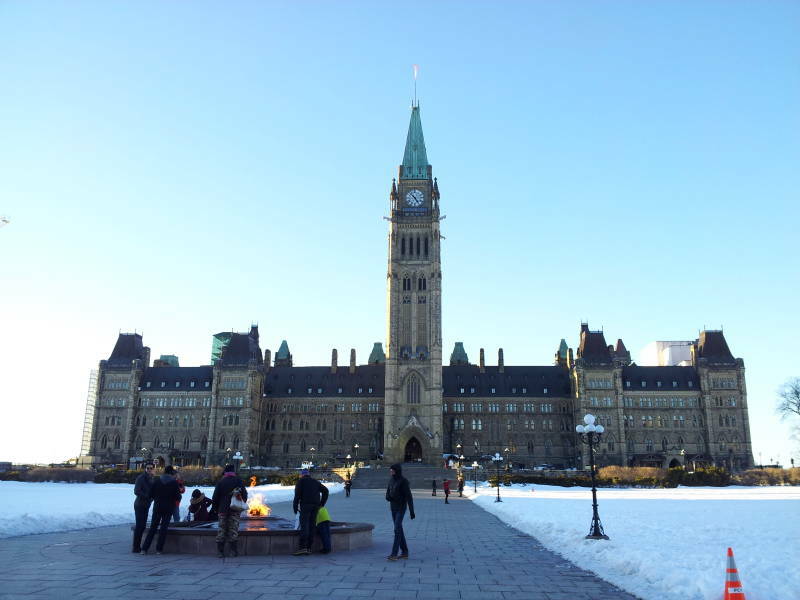 The temperature in Ottawa was dropping from -29 to -32 °C (or from -20 to -25 °F) when I arrived on Saturday afternoon. It took quite a while for our luggage to appear at the airport's baggage claim area, because they had trouble getting the plane's cargo doors open. The wind chill Saturday evening was -39 °C. I was hoping for just one more degree, the magic -40 that's the same in Celcius and Farenheit. -39 was still plenty refreshing. Above is the view out my hotel room. 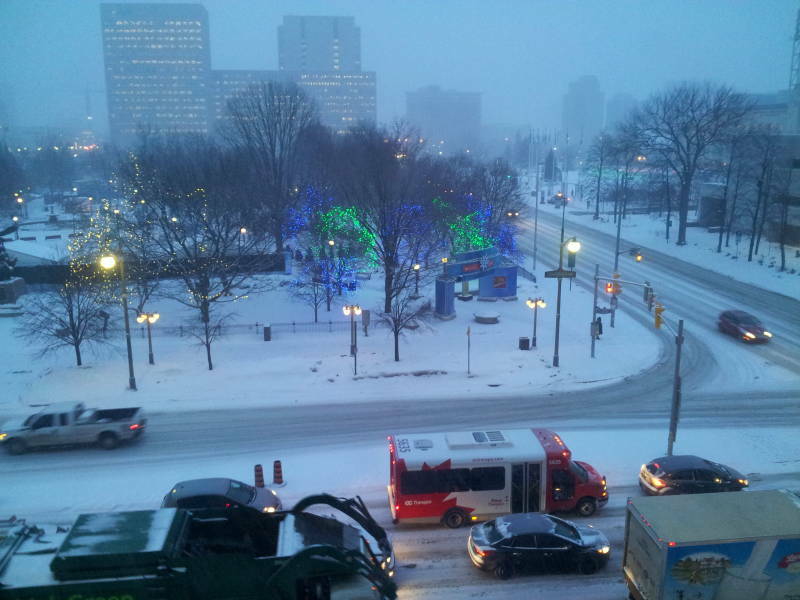 We're looking across Elgin Avenue to Confederation Park with Winterlude, and federal government buildings beyond it. It had warmed up to the day's high temperature of -24 °C (or -11 °F) by late morning, so it was time to go out and do some tourism. 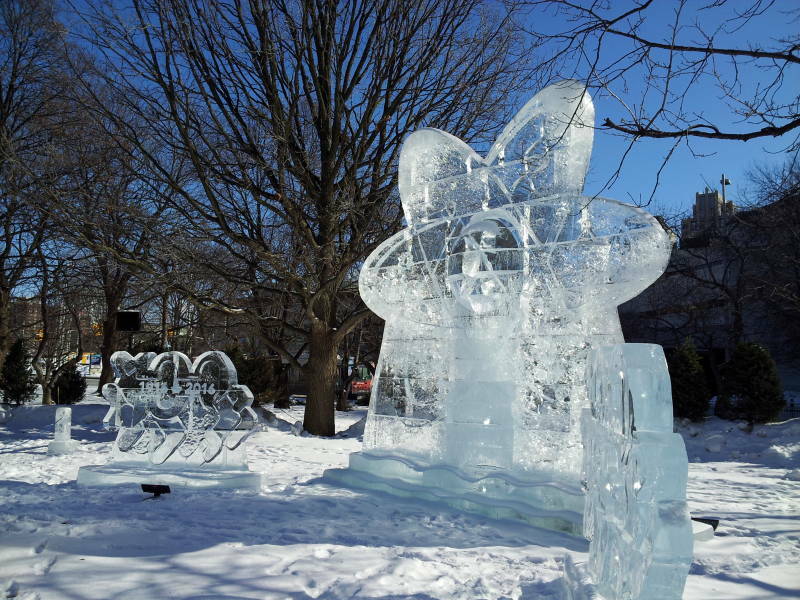 There were ice sculptures, the ice lounge, and concerts in Confederation Park. Several stands were selling food and drinks. 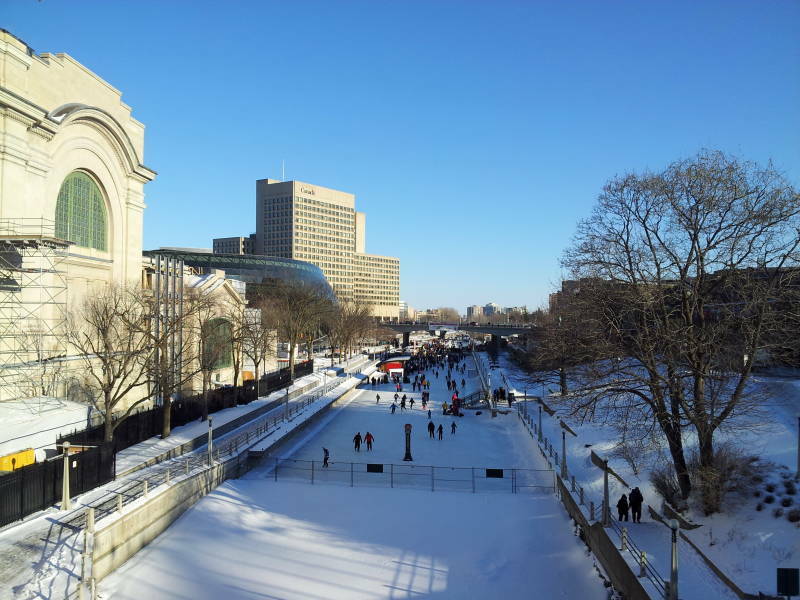 The Rideau Canal runs through central Ottawa. It runs for 202 km to Lake Ontario and the Saint Lawrence River at Kingston, Ontario, connecting that to the Ottawa River. 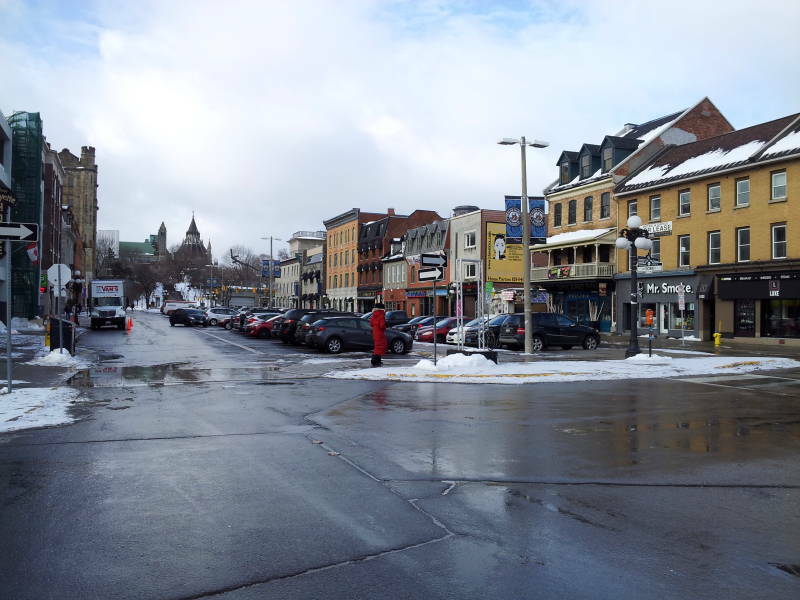 It uses sections of the Rideau and Cataraqui rivers and several lakes. About 19 km of the canal was made by excavating an artificial channel. The locks are open for navigation from mid-May through mid-October. The canal was built in 1826–1832. It's the oldest continuously operated canal system in North America. The Rideau Canal can handle boats up to 27.4 m long and 7.9 m abeam, with a maximum draft of 1.5 m and up to 6.7 m above waterline. 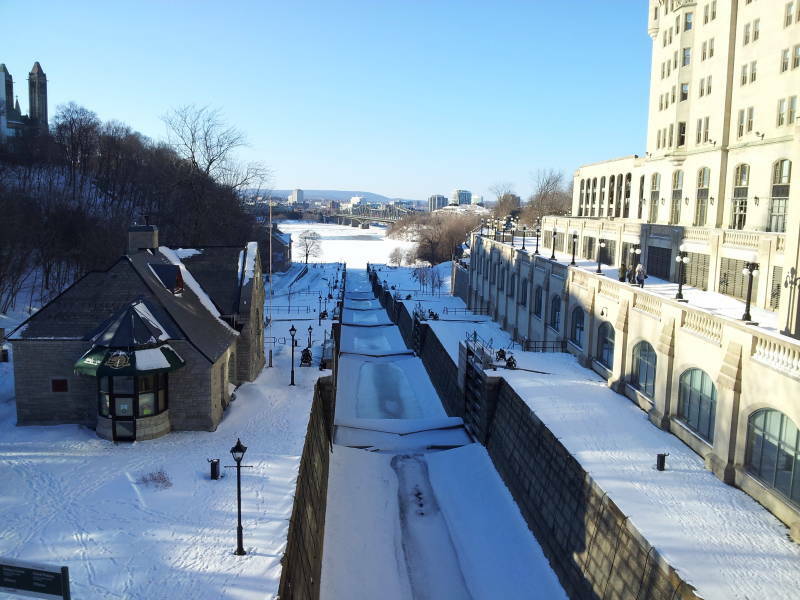 The 7.8 km section of the canal from Château Laurier, where I'm standing in the below picture, to the locks at Carleton University becomes the world's largest and third-longest skating rink every winter.. #1 and #2 are also in Canada — Winnipeg has a 9.3 km corridor along the Assiniboine and Red rivers, and Lake Windermere in Invermere B.C. has a 30 km skating trail. 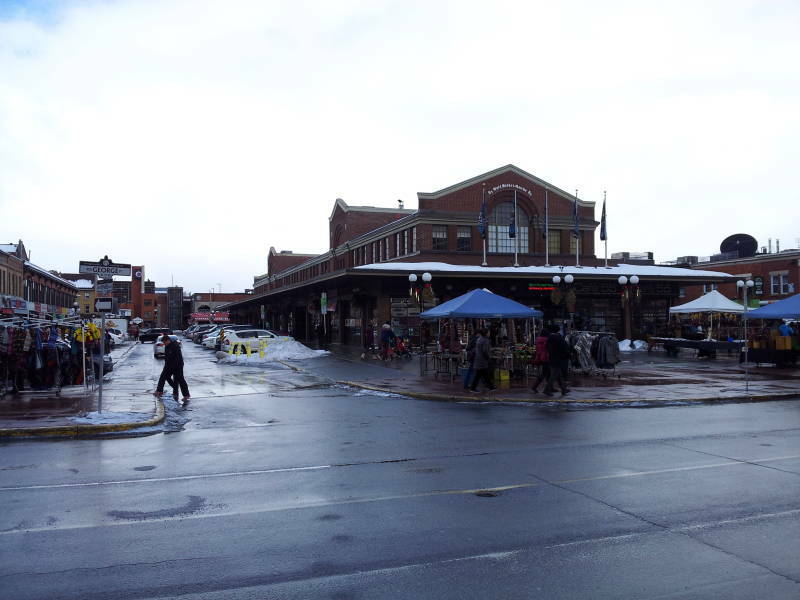 The building at left here used to be Ottawa's main train station. Now it's a government building, and the Via Rail Ottawa Train Station is south of downtown. 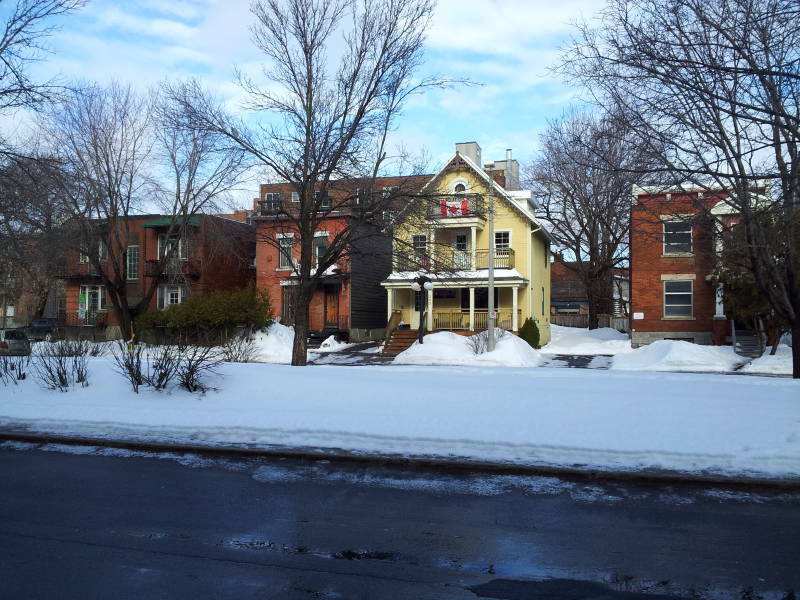 It's about two kilometers south along the Rideau Canal, off in the distance in the picture above, then a few blocksto the east. A flight of six locks connects the canal down to the Ottawa River, Rivière des Outaouais. That's the Château Laurier at right. Château Laurier was commissioned by Charles Melville Hays, the president of the Grand Trunk Railway. The hotel was built between 1909 and 1912 in parallel with Union Station. The two buildings were connected with a tunnel, so you could move between a train and a hotel room without going outdoors. The Grand Trunk became part of the Canadian National Railway in 1923. The Château Laurier then became one of CN's most important hotels. From July 1924 to October 2004, the 7th and 8th floors were home to the Canadian Broadcasting Corporation's local English and French language radio stations. 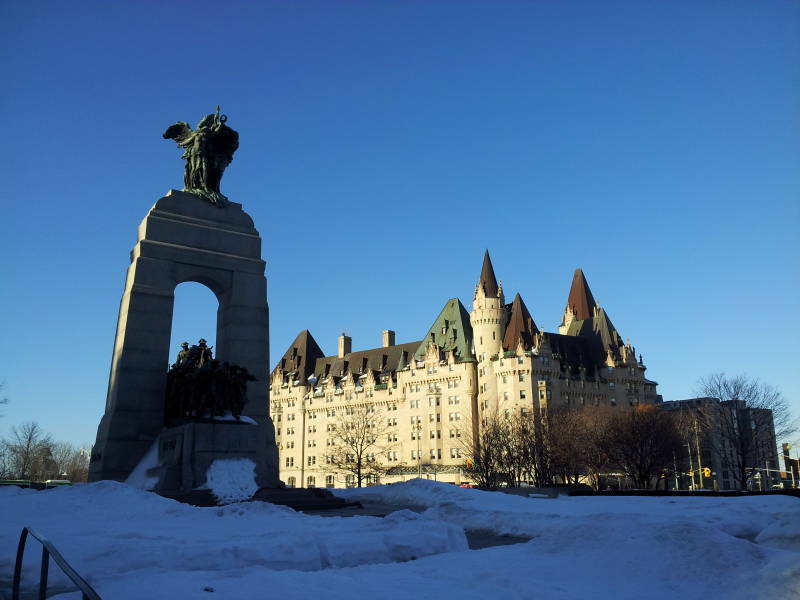 The National War Memorial is shown below, with Château Laurier in the background. The memorial was originally built to commemorate the Canadians who died in the First World War. It was rededicated in 1982 to also include those killed in World War II and the Korean War. Then again in 2014, to add all Canadians killed in all conflicts. 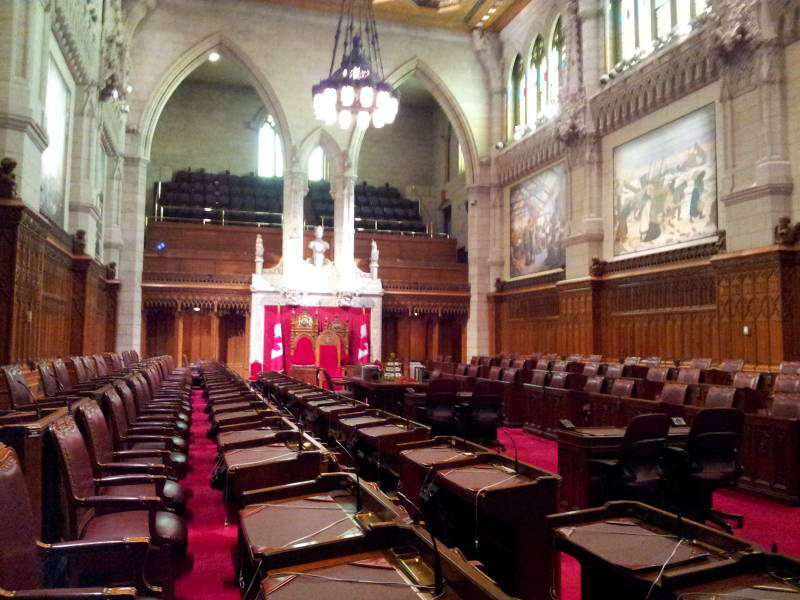 Centre Block is the main building of the Canadian Parliament. 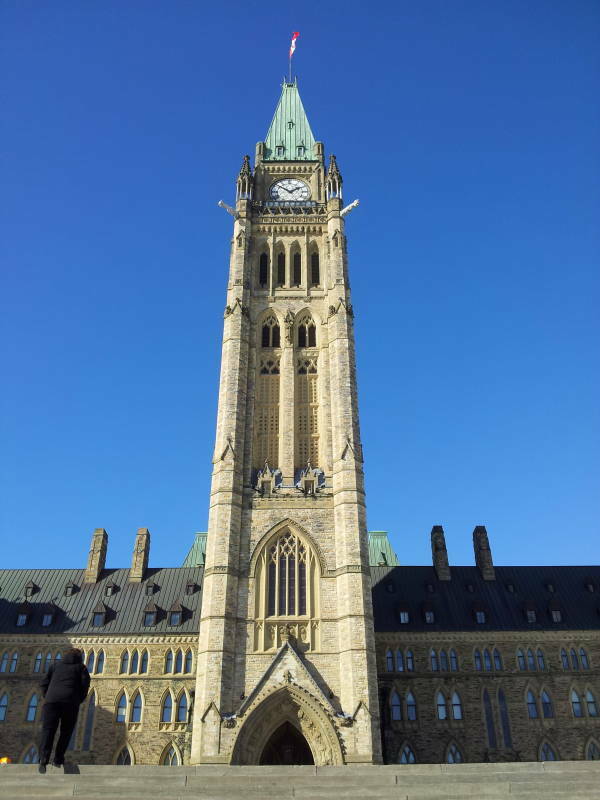 The Peace Tower is 92.2 m tall. The eternal flame provides a little heat when it's really cold. 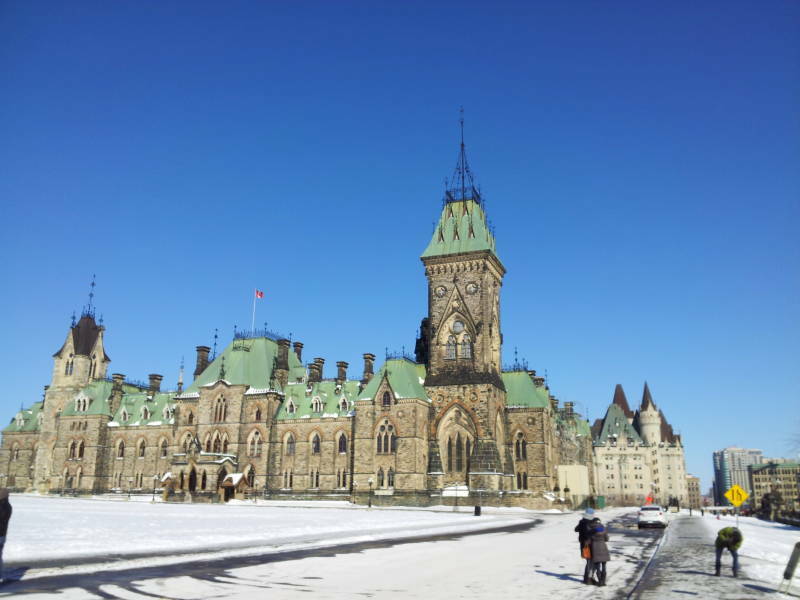 Above is the East Block of Parliament, with Château Laurier in the background. Soon it was Monday evening, the class would start in the morning. It started snowing overnight, and there was quite a bit on the ground by the time I started out in the morning. 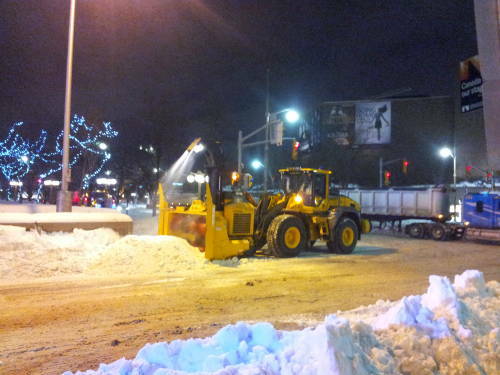 By Tuesday afternoon it had passed the 40.6 cm record for a one-day snowfall in February. The total and new record that evening was 50.9 cm. Notice how there is a narrow lane that had been cleared between the sidewalk and the street in the picture above. 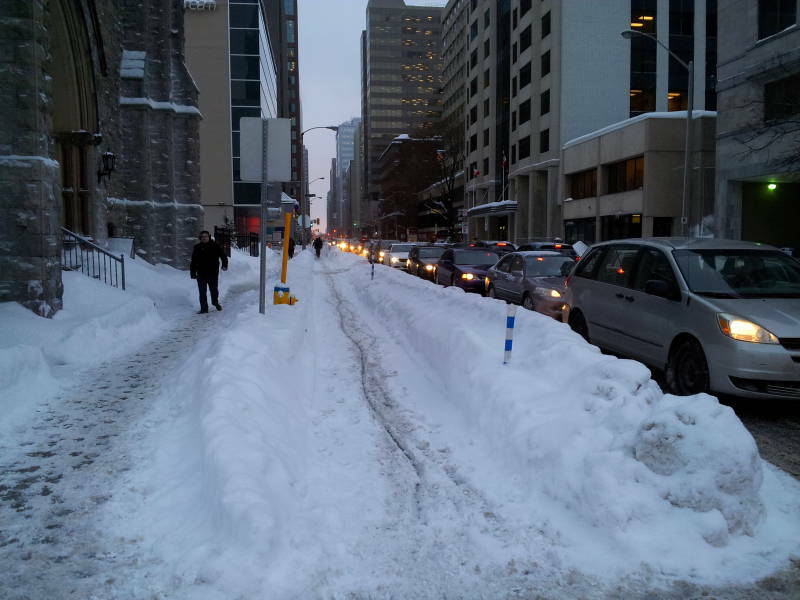 That's the bicycle lane, which has become a little difficult to use with the accumulating snow. This is late Tuesday afternoon, on the way back to the hotel. 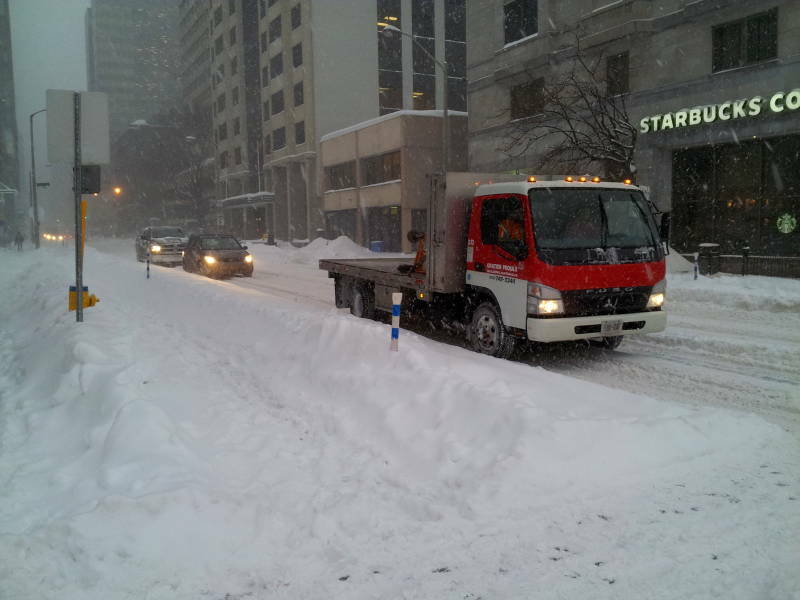 Canada knows how to deal with snow, of course. Equipment worked all day and into the night. 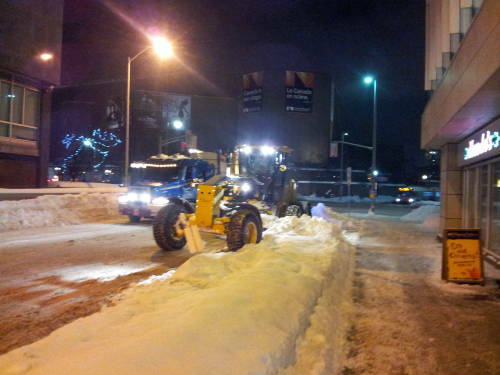 By morning, the bicycle lanes had been cleared enough to be used by several bike commuters! The class went well, as I expected. 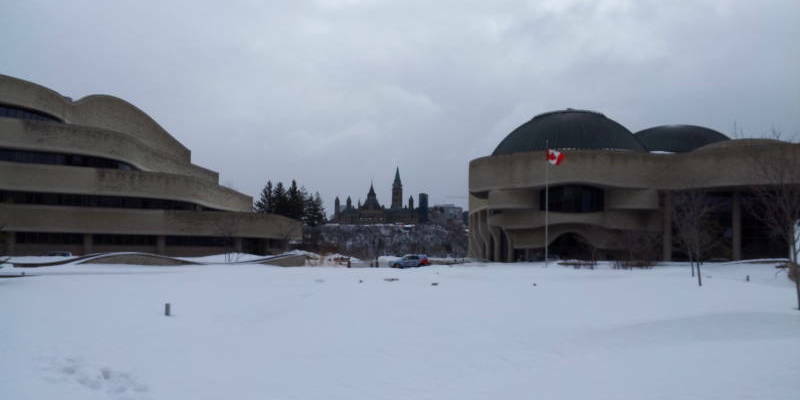 I was going to stay on in Ottawa for a few more days, so I checked out of the Lord Elgin on Friday morning. 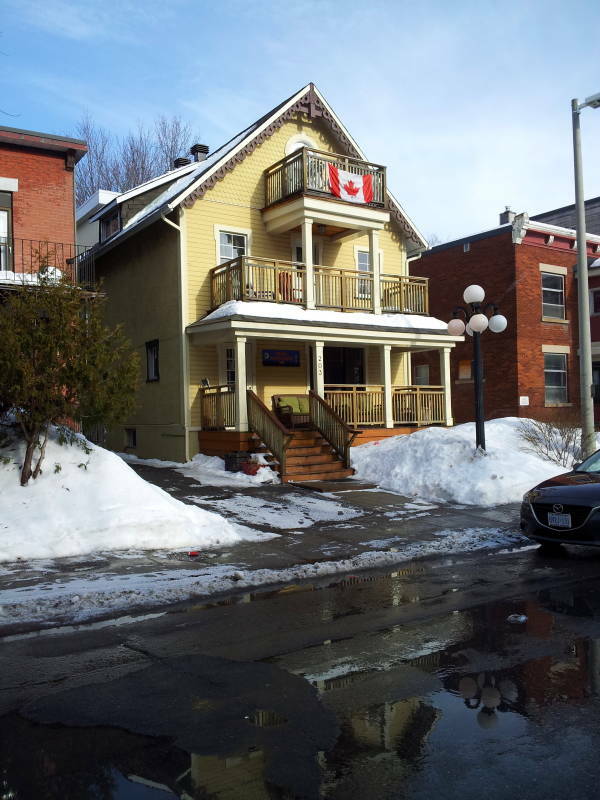 After the class ended on Friday, I walked to the Ottawa Backpackers Inn. I had stayed there during warm weather several years before. Up past Château Laurier, then east a few blocks past ByWard Market. 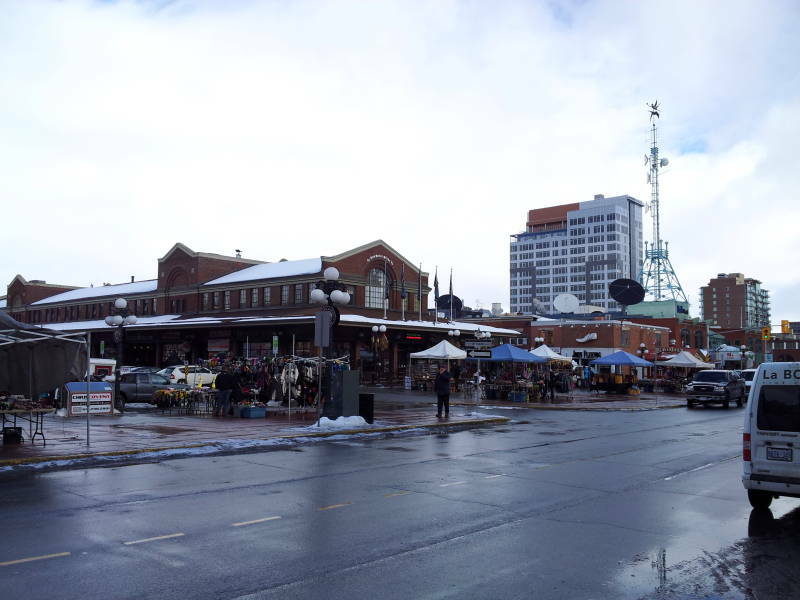 ByWard Market, also called "By Ward" and "Byward", is the area where Colonel By built a large market building in 1827. 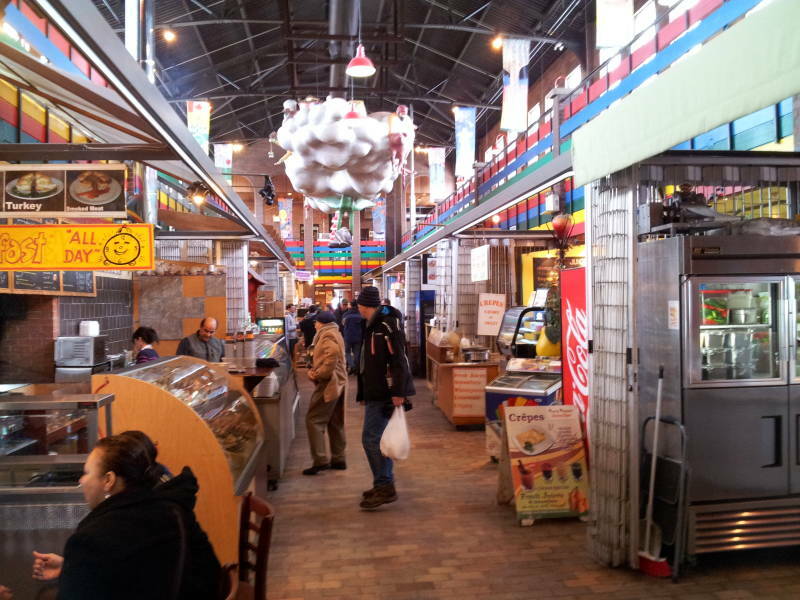 It is once again a busy market area. 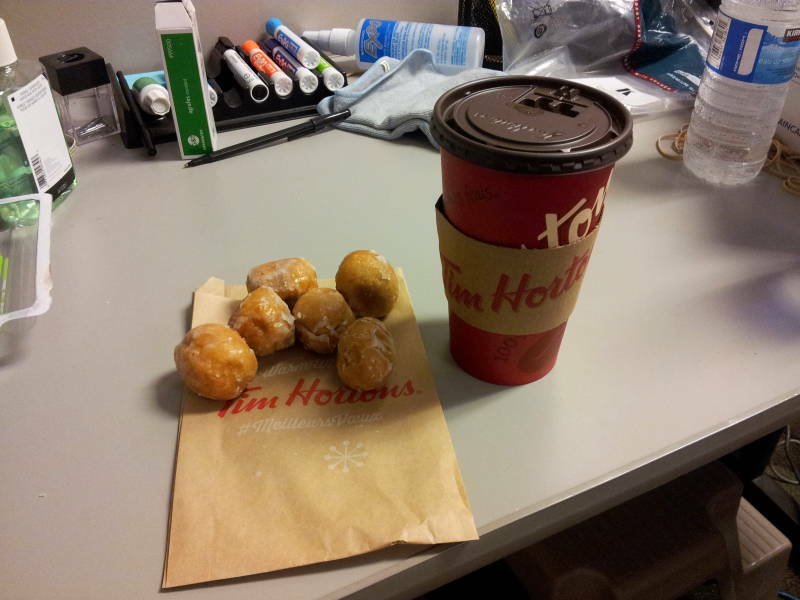 Tim Horton's, I would pick up breakfast there before class. 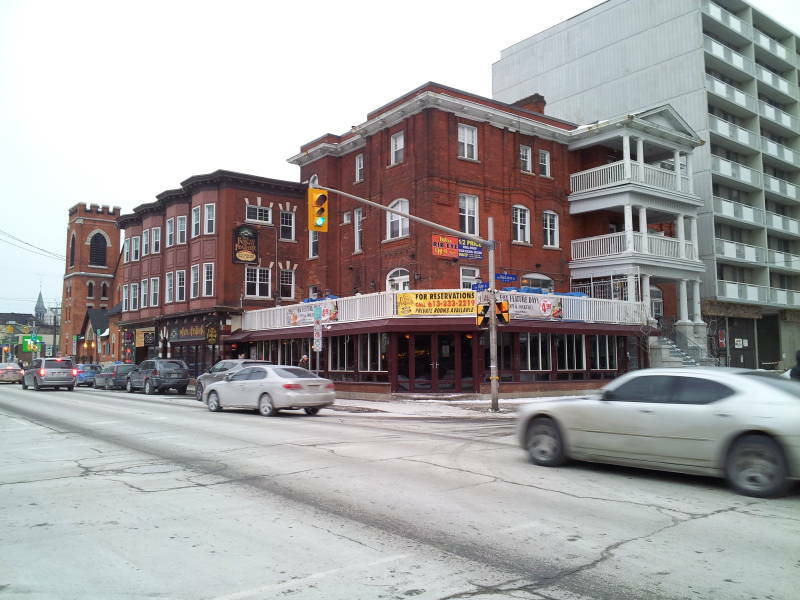 Once I was at the Backpacker's Inn, it was just a couple of blocks to ByWard Market. 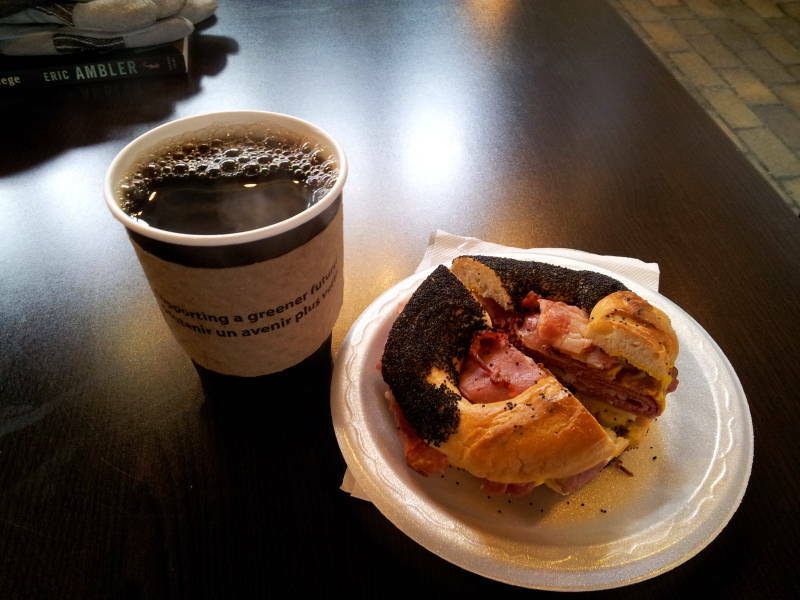 Smoked meat on a bagel for breakfast. 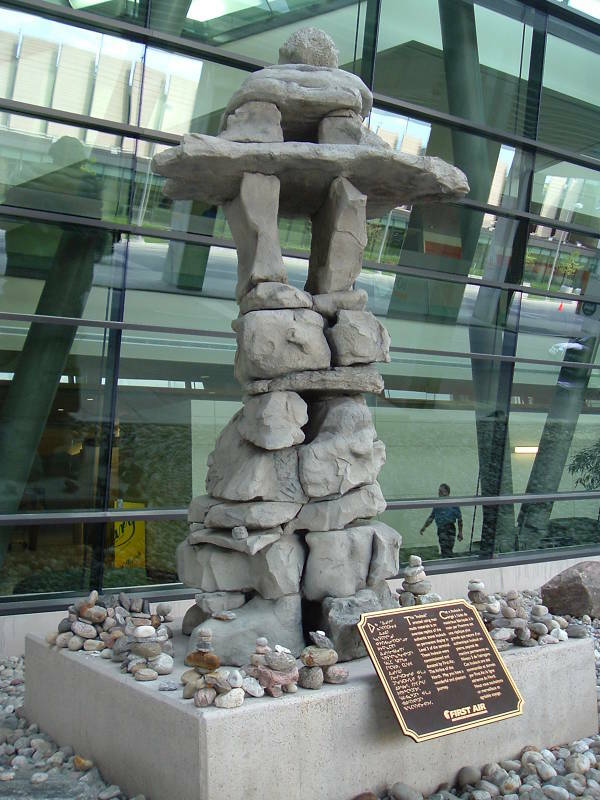 An inuksuk is a man-made stone landmark used by the Inuit, Iñupiat, Kalaallit, Yupik, and other Arctic people of North America. The word means "that which acts in the capacity of a human". One is an inuksuk, several are inuksuit. Or, ᐃᓄᒃᓱᒃ and ᐃᓄᒃᓱᐃᑦ respectively, in the Inuktitut syllabics. An inuksuk can be used for navigation. It can mark a fishing place, a camping ground, a place of veneration, or a food cache. A similar construction, meant to represent a human figure, is an inunnguaq or ᐃᓄᙳᐊᖅ. They have become familiar to non-Inuit. See, for example, the cover of the Rush album Test For Echo. 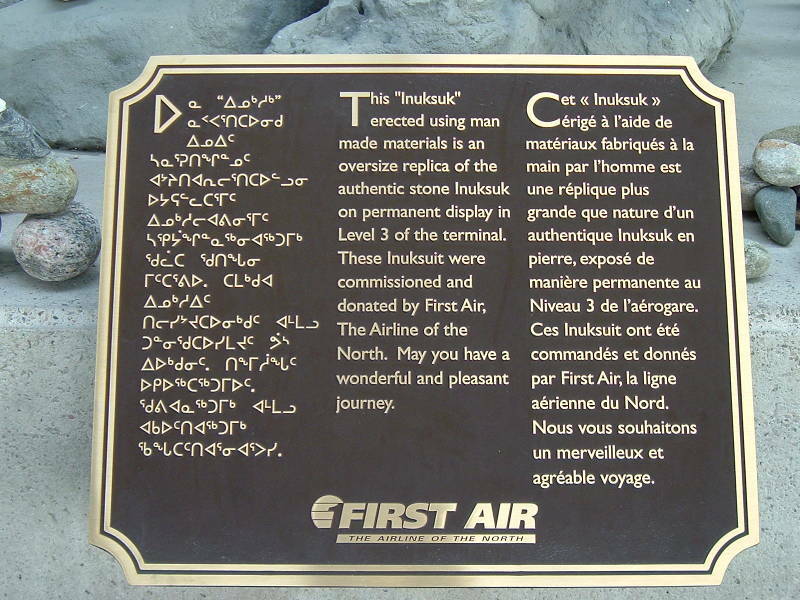 The problem at the Toronto airport started when an Inuit artist built some inunnguat. (Those being multiple inunnguaq) They were built in a studio, then marked, disassembled, and shipped to Toronto. There, construction workers figured that they would improve the inunnguat by reassembling them so they appeared to be waving in greeting. Or so they saw it. The result, inunnguat with their arms raised, meant "Stay away! This is a place of violent death!" Not really what you want at your airport entrance. 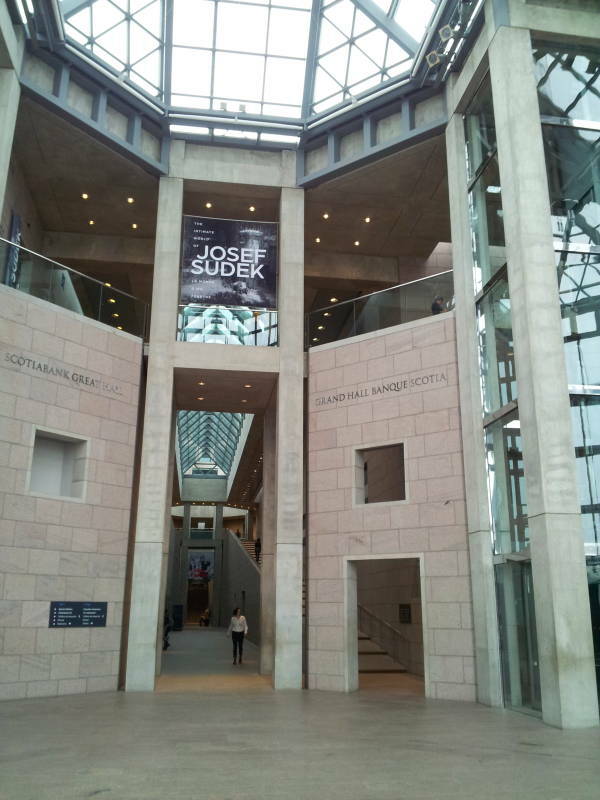 The National Gallery of Canada is the nation's most prominent art museum. 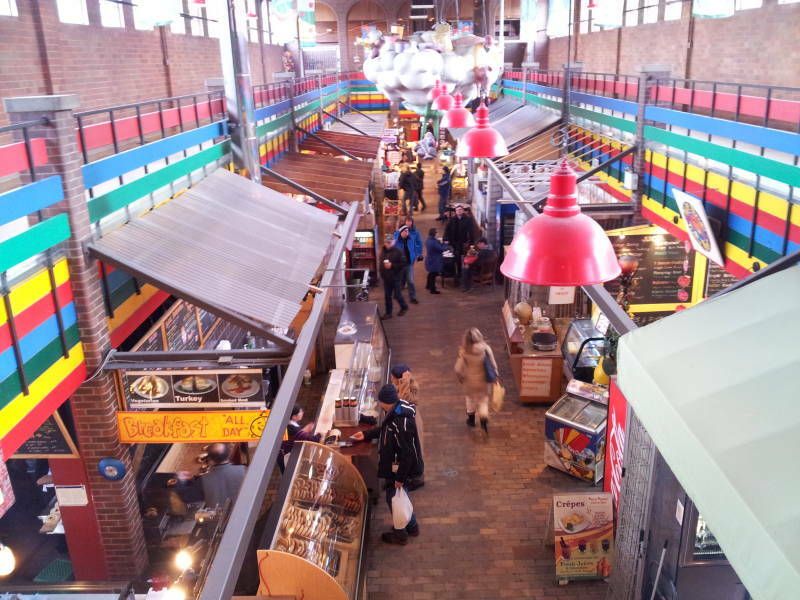 It's a short walk from Parliament Hill and ByWard Market. 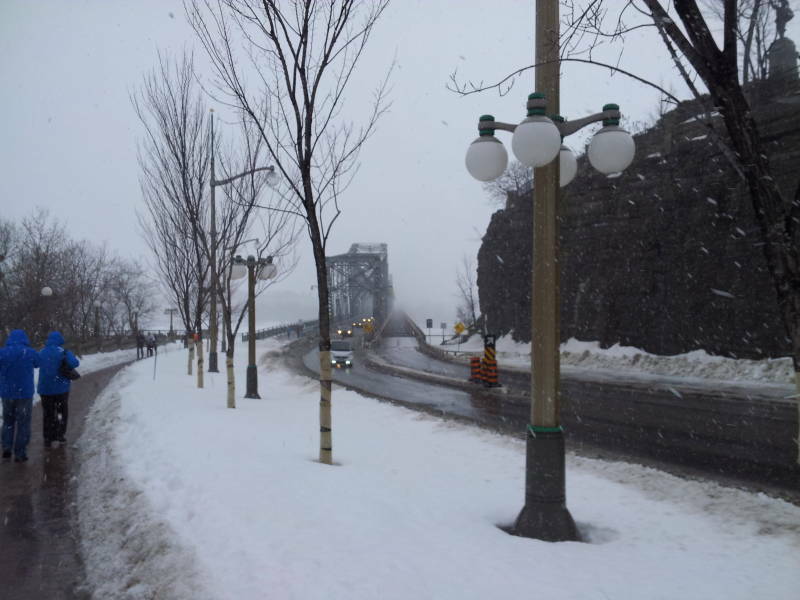 From there it's a short distance to the Alexandra Bridge over the Ottawa River or Rivière des Outaouais, to Gatineau. Here we go, on a day with more snow falling. 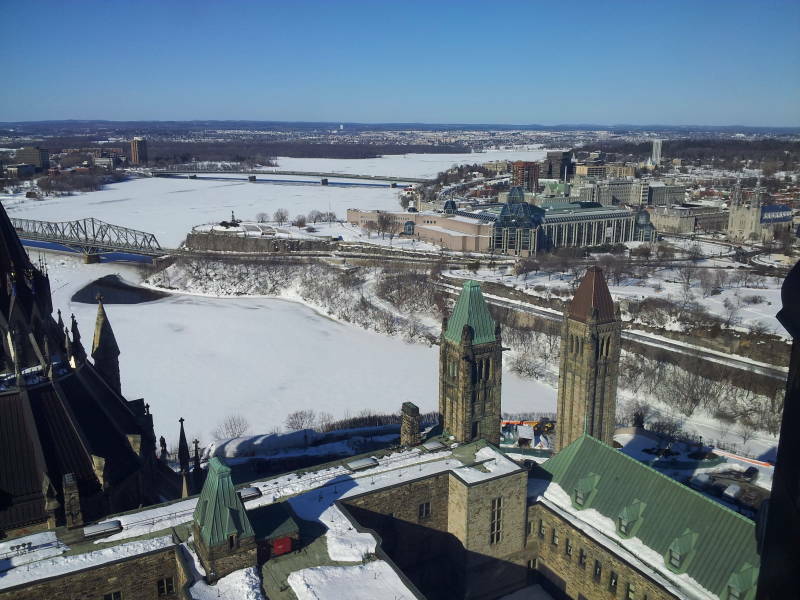 Above, we're looking back across the river to Parliament Hill. 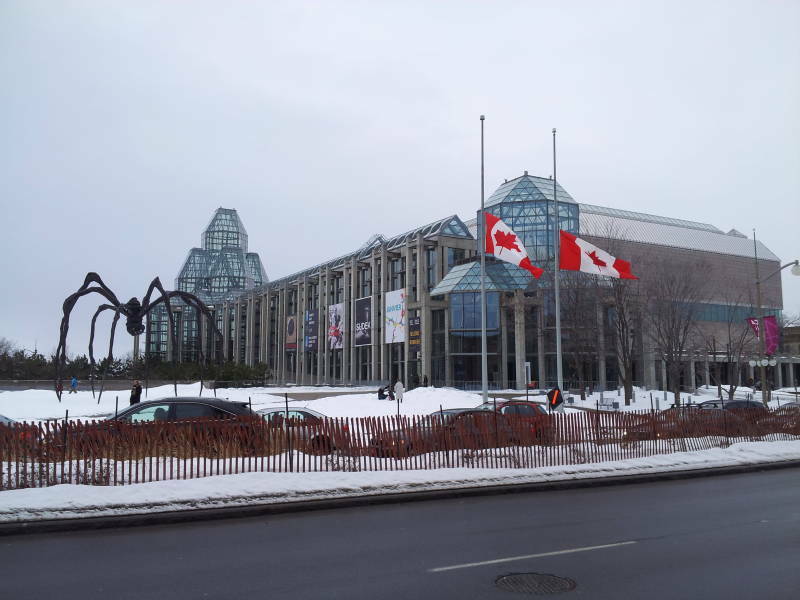 Below, we have arrived at the Canadian Museum of History, formerly the Museum of Civilization, in Gatineau. 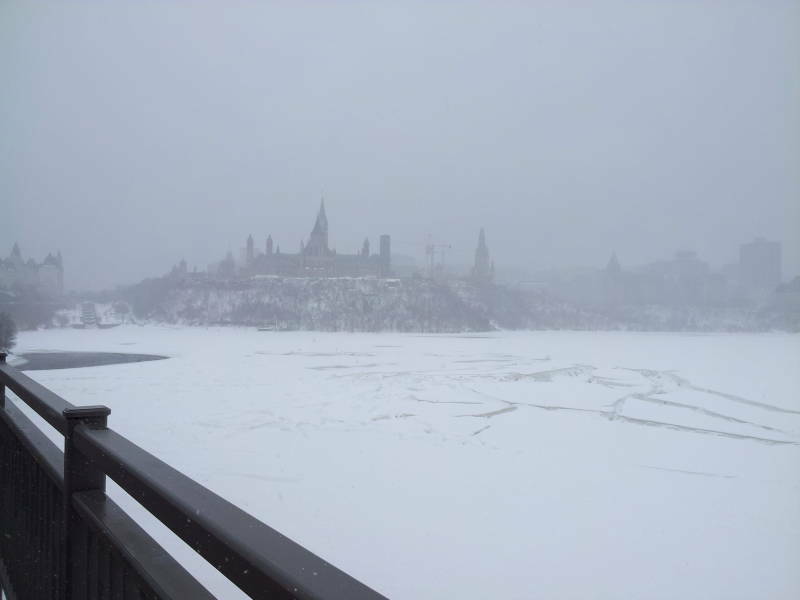 The snow has stopped, so we can see Parliament Hill between the museum buildings and across the river. 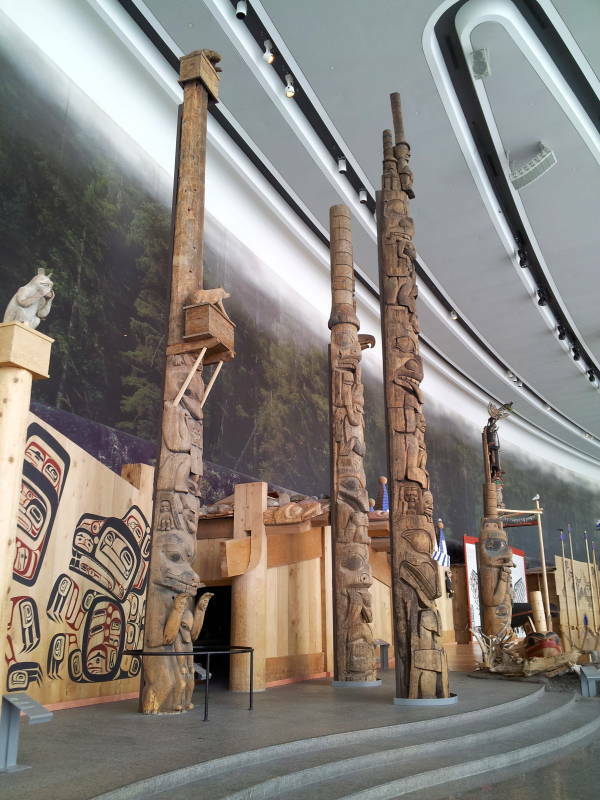 The museum presents the human history and cultural diversity of Canada. 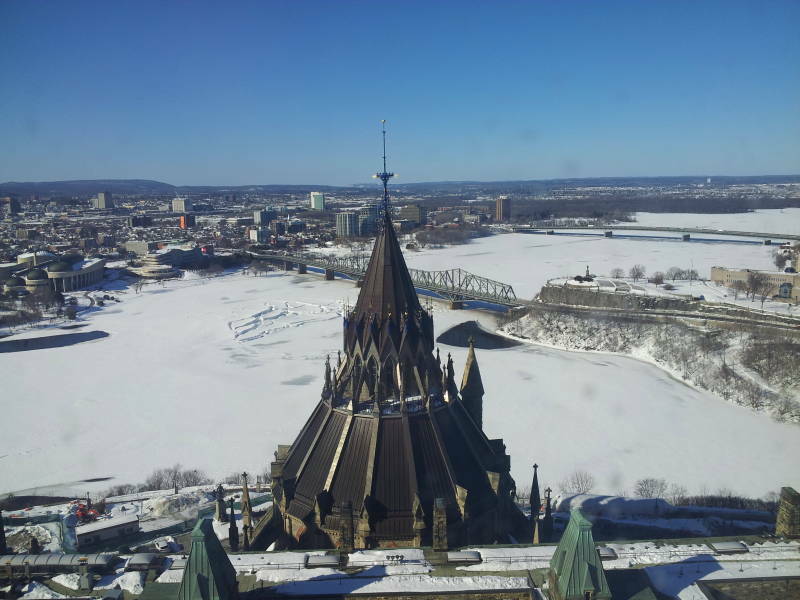 On a clear day I'll go to Parliament, touring the building and going up to the observation area in the Peace Tower. View to the northwest, looking up to Ottawa River. View to the northeast, with the Museum of History near the center. View to the northeast, over the conical roof of the Library of Parliament and the Alexandra Bridge. 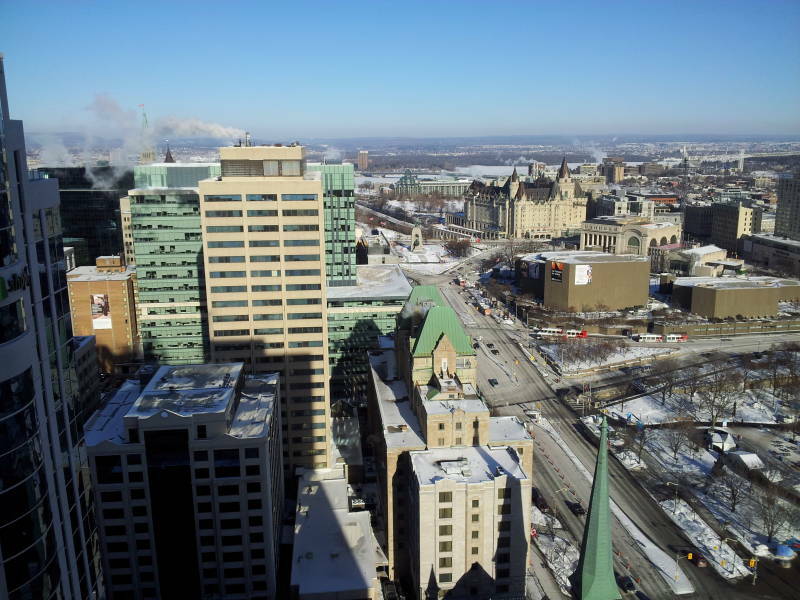 View to the east, over the National Gallery of Art and down the Ottawa River. View to the east, over the By Ward Market area. 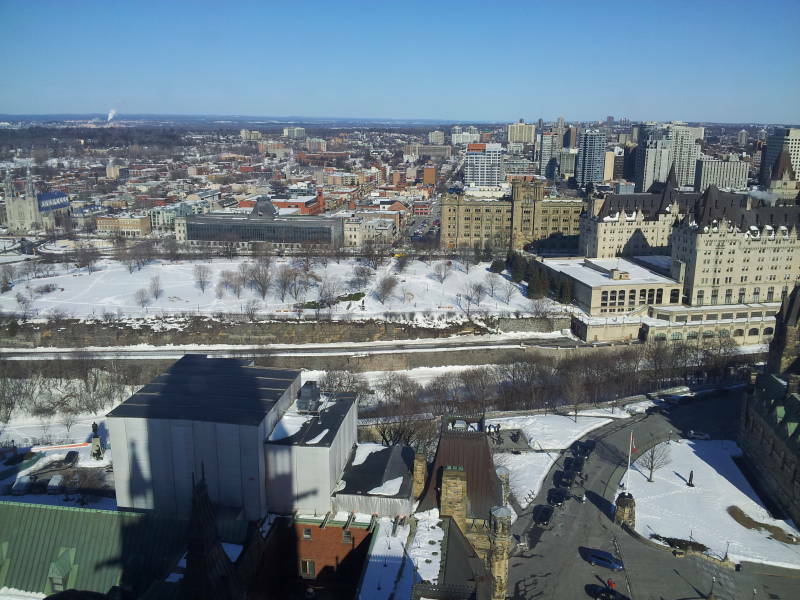 View to the southeast, over the Château Laurier, the former Union Station, and the Rideau Canal. 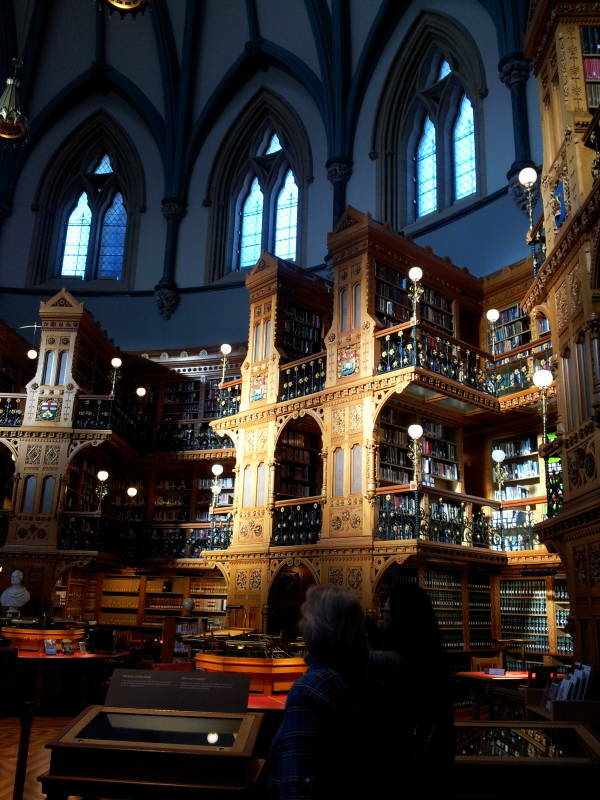 The highlight of the tour of Parliament is the Library. 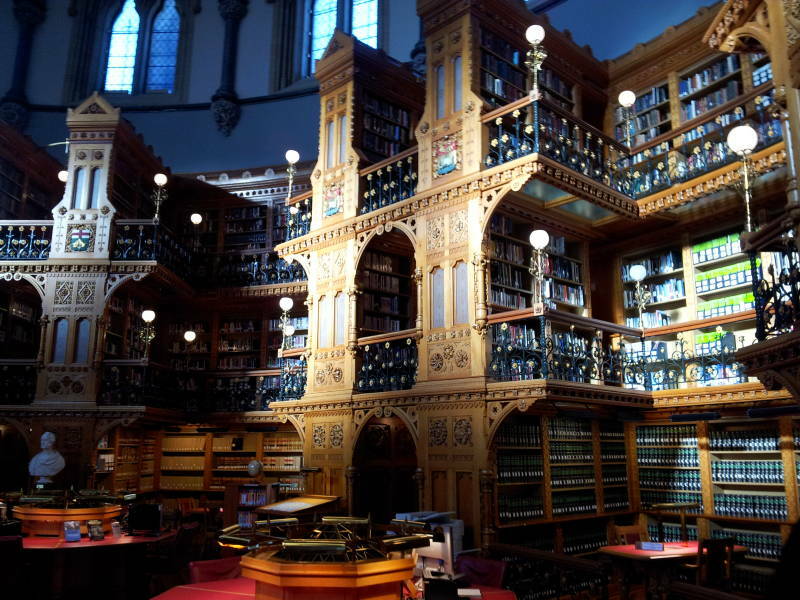 The main reading room is the central hub of the Library of Parliament system. A staff of 300 maintains over 650,000 items. 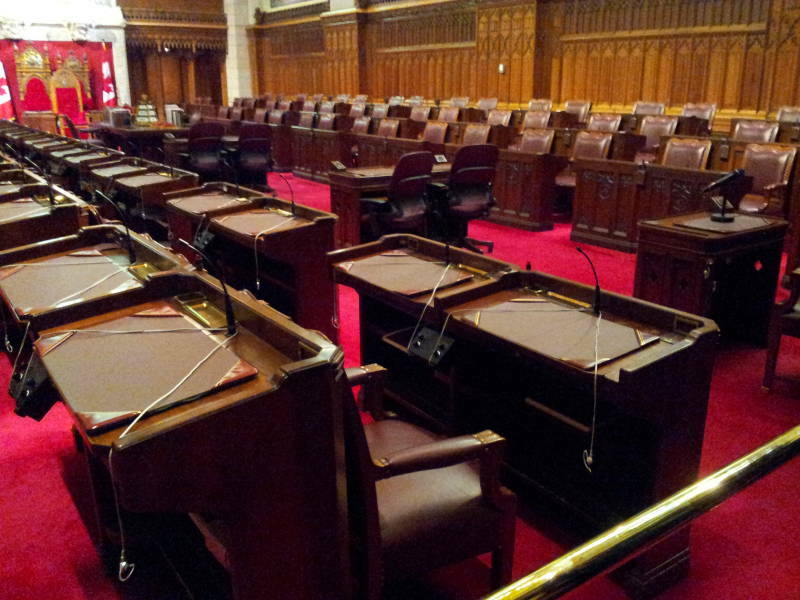 And, they take you into the Canadian Senate Chamber.